Boulcott’s Farm Heritage Golf Club is the body formed on the merging of The Hutt Golf Club and The Boulcott Golf Club. On 1 September 2010 the former Hutt Golf Club and Boulcott Golf Club merged to form Boulcott’s Farm Heritage Golf Club. A lease was arranged off the Wellington Racing Club grounds at Seaview, Lower Hutt and nine holes were laid out in the centre of the Racecourse. An adjoining section was purchased and a clubhouse built. By the time of the first tournament, the nine holes were ready for play varying in length from 160 to 400 yards. The development work exhausted most of the club’s funds and while there was room for extra holes, any extension had to be delayed until funds were available. The Club hosted in October 1895 the third New Zealand Golf Championships, the only time Hutt has hosted the country’s premier tournament. In 1897 the course was extended outside the area enclosed by the Racecourse and by 1902 15 holes were available, although the ground was frequently sloppy and the greens inferior. Poor drainage meant rain left the low-lying ground very heavy and prone to flooding. It was decided that a new site needed to be found and after looking at various options, including Gear Island, now the home of Shandon Golf Club, some land north of the Lower Hutt township was sought. In 1908 the club purchased 108 acres of river flat land for three thousand pounds. The land was gently undulating but very stony, particularly where the western boundary followed the Hutt River, and it was covered in gorse. The club formally opened the course (initially nine holes) on 29 May 1909. There were 13 holes being played regularly by 1911 but it would be another 10 years before the full course was ready for play. Alterations and improvements continued gradually, with the Hutt course finally being completed in its merged form in around 1990. A major fire in October 1965 caused considerable damage and a new two-storey complex was officially opened on the club’s 75th anniversary in 1967. The parts of the old clubhouse not damaged were incorporated into the new structure. In 1987 an automatic sprinkling system to all greens, tees and fairways was installed, the most ambitious project since the clubhouse reconstruction, with all 18 holes being completed in one operation and allowing for excellent year-round playing conditions. With the Championship-length Hutt course long being regarded as one of the best manicured in the country, it has hosted many significant events over its long and proud history. More recently the club has hosted the Junior Tasman Cup (2006), and the NZ Secondary Schools Championships (2007) and the North Island Strokeplay Championship (2009). Since 1892 at the old Racing Club grounds, and then from 1908 at the current site, the Hutt Golf Club has made its mark on the Wellington golfing landscape. It has won many Premiership Interclub events and continued to stand out as one of the quality courses with facilities to match. Boulcott Golf Club was one of the Hutt Valley’s most well-loved sporting clubs, its members priding themselves on the friendly atmosphere and love of social occasions. In October 1937 the club had its beginnings when a group of local golfers, who up until that point had played on a “rough little track” on top of a riverbank, negotiated with a local landowner to lease an area of land which was then be developed into the nine-hole course. 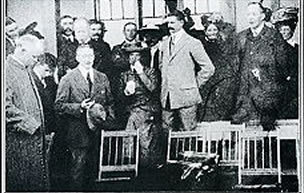 In February 1938 the first annual general meeting was held. In 1950 the club had the chance to purchase the land and at a special general meeting on 20 July 1950 the 54 members attending bought the course. The 1950s and 60s saw continued development on both the course along with the clubhouse construction. During 2008 and 2009, the Greater Wellington Regional Council confirmed its intentions to upgrade the stopbanks and both Clubs were approached for their input. Various alternative alignments were considered and both Clubs finally agreed to the current alignment. As a consequence, the merging of the two Clubs was pursued. Boulcott’s Farm Heritage Golf Club is the consequence of that merger with both Clubs merging into the new entity on 1 September 2010. With the construction of the stop bank, the GWRC undertook to reinstate the golf holes affected. As part of the agreement, 12 of the 18 holes of the new layout were constructed together with a 6 hole short course. The intent of the short course was to provide access to golf to the disabled and provide a facility where golfers could play a quick game. The construction with paved paths reflects that intent. The new course is close to 6,000 metres in length and when completed will be 6,300 metres. It has been built to Championship standard and is to be maintained to that level. The development is ambitious and is looking ahead to golf in the future.